Robotic Color Sorting Five Finger Robot Arm. It can see colors. This exhibit relates to STEM education. Press the start button and the balls in the main activity area are agitated. As they work their way to the activity side ball retrieval collection point, the robot arm moves its hand over a ball and the color sensor located in the hand looks at it to determine the color. 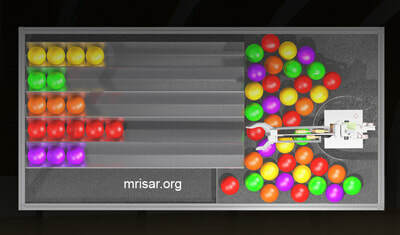 It then grasps the ball and moves it to the correct collection area for that specific color. 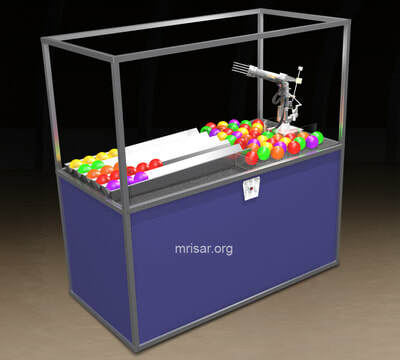 As the remaining balls are agitated and move forward, the rest of the balls are sorted by the robot arm. 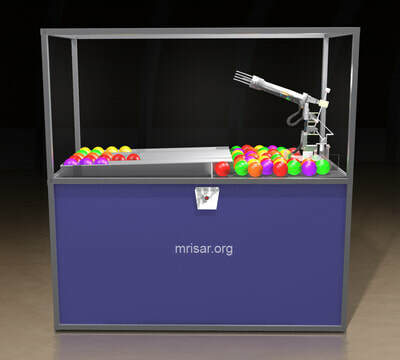 When all of the balls are sorted into each correct color area path the robot arm resets to full up and back position and the entire sorted section of the activity automatically tips up and rolls the balls back to the unsorted activity area while agitating them into random placement for the next turn. 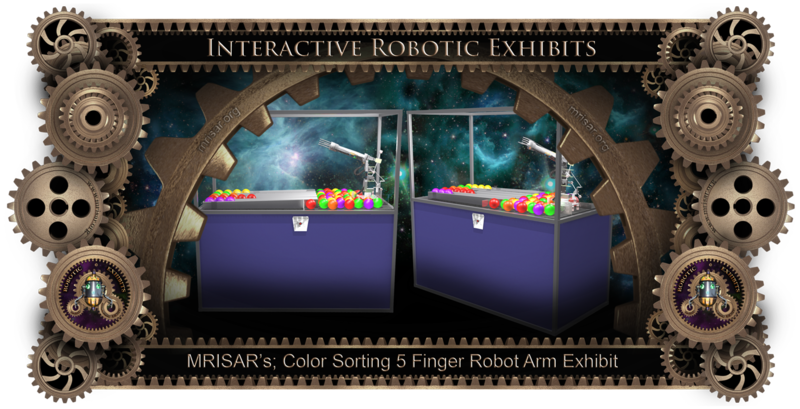 The exhibit teaches elements of robotics, STEM based education, electrical and electromechanical engineering, photonics, optics, elements of the electromagnetic spectrum and to an extent an element of Chaos Theory. The exhibit can be made with your choice of laminate chosen from a standard selection which has many color options. 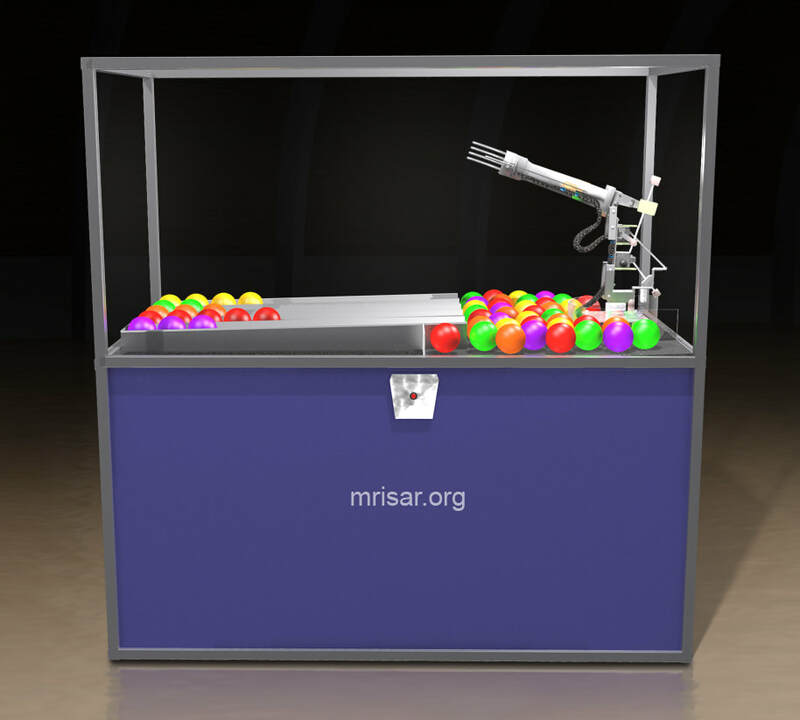 This exhibit features a 39" long, nine range of motion, 5 finger electromechanical robot arm that is base mounted on the exhibit activity surface. The exhibit activity is totally encased by clear poly-carbonate that allows many people to view the exhibit while it is being operated. The electromechanical arm is designed in a totally open format, all the parts and the key components that operate it are visible for maximum educational merit. This relates to STEM education. 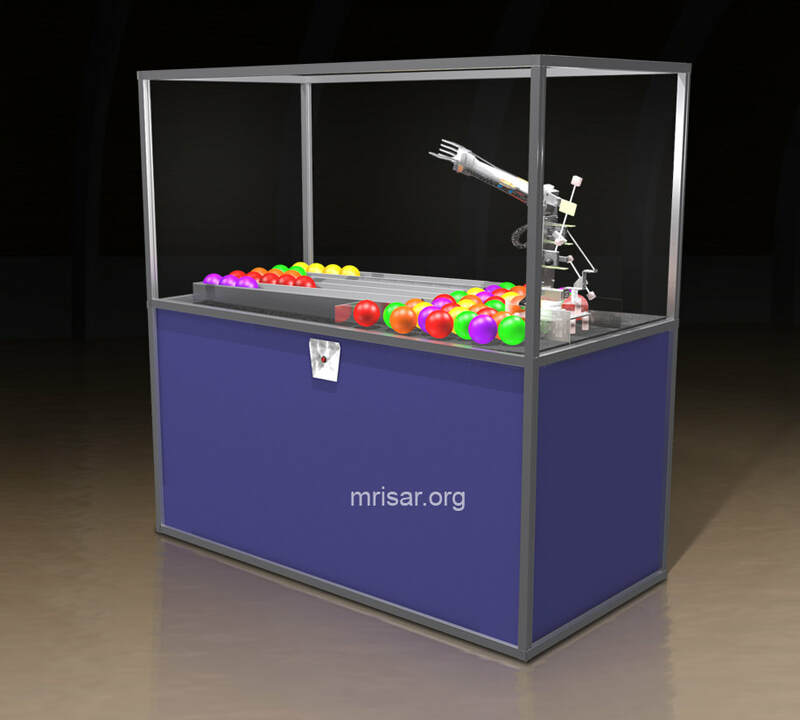 The exhibit provides a unique format to study the engineering principles of a robot arm. The arm has pressure sensitive and end of travel limits, and can adapt to objects stacked in its path. Remote handling robots are used by industry, aerospace and commercial establishments to extend human capabilities in hazardous situations. 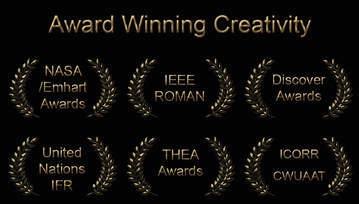 ​Approximate size of exhibit is; 35" wide x 76" long x 72" high.